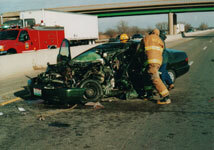 Crash Forensics provides wheel and hub failure analysis services for passenger vehicles and heavy trucks. Failure analysis services can be conducted "on site" from our mobile lab or "in house" in our automotive lab. Below is a discussion of wheel and hub failures. Link to our automotive expert. 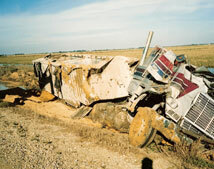 Crashes caused by wheels coming off of vehicles are commonly referred to as wheel runoff crashes. Two primary failures cause wheel runoff crashes. One is a failure of the wheel mounting system, such as the wheel studs, lug nuts, etc. 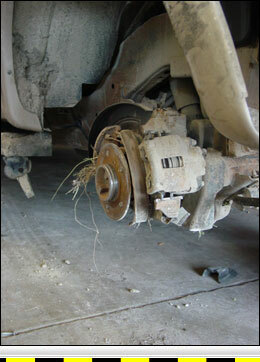 The other cause is a failure of the hub and wheel bearing assembly. Most commonly, these failures are related to improper or deferred maintenance, but some are also linked to manufacturer's defects. Wheel system failures are primarily caused by the improper installation of a wheel that causes it to be loose or become loose. 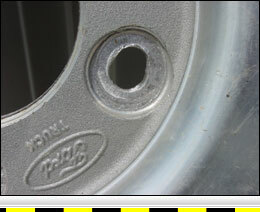 Commonly, a loose wheel causes the wheels studs to break and the wheel and tire to separate from the vehicle. Many root causes lead to loose wheels, but most of them are associated with over-torquing or under-torquing the lug nuts. A bolted joint, such as a wheel mounting system, works by tightly clamping two surfaces together. The friction of the two mated surfaces and the force created from clamping them together with bolts (Clamp Load) allows the surfaces to resist movement. The amount of friction and Clamp Load determines the level of resistance the joint has to movement. Clamp Load is created by tightening the bolts against the mated surfaces and is normally measured in foot pounds of torque with a torque wrench. If the bolt torque specified for a joint is applied, then the resultant Clamp Load should also be within specification. However, variations in the system such as rust or lubrication on the threads can affect the Clamp Load vs. torque relationship. Items in place between the mated surfaces can reduce the joint's friction and also alter the relationship between bolt torque and Clamp Load. This is called a Soft Joint. Two concepts are important to understanding how a bolt works. They are Elastic Deformation and Yield Point. Elastic Deformation is metal's or, in this case, a bolt's ability to stretch and spring back to its original shape. Yield Point is where the bolt has been stretched past its elastic limit and can no longer spring back to its original shape. This stretching of a bolt and its pulling back creates Clamp Load. If, however, a bolt is over-torqued, and stretches past its Yield Point it can no longer maintain the Clamp Load. Over-torquing is likely the most common wheel system failure due to the widespread use of impact wrenches to install wheels. Using an impact wrench to install wheels commonly causes the wheels to have 3 to 5 times the specified lug nut torque. The use of lubricants and anti-sizing compounds on the threads of the wheels studs or lug nuts can cause an even higher degree of over-torquing. The specific torque required to install a wheel varies from vehicle to vehicle. Generally, the proper torque for the lug nuts on passenger vehicles will be around 100 foot-pounds and the proper torque for big trucks will be around 400 foot-pounds. Impact wrenches commonly used to install wheels on passenger vehicles are capable of producing 300 to 500 foot-pounds of torque. Impact wrenches used to install wheels on big trucks can produce 1200 to 2000 foot-pounds or torque. Under-torquing is just simply not tightening the wheel lug nuts enough, causing the wheel to be loose. 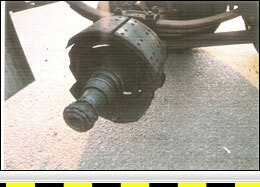 Under-torquing can be caused by corroded and damaged wheel system components. It can also be caused by using a cheap or worn-out impact wrench or by having a low air-pressure supply to an impact wrench. 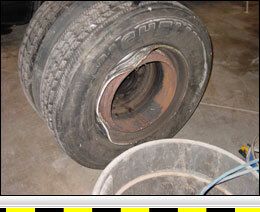 Another common cause of wheel system failures is too much wheel paint thickness. As specified by the Recommended Practice PR222B from The Maintenance Council (TMC) of The American Trucking Association "Total thickness of the dried paint coating on each side of the wheel mounting face must not exceed 3 mils (.003 inch)." If the wheel's paint is too thick, then a soft joint is created and the system can fail. Paint thickness defects are not only caused by original production painting but also more commonly caused by the recondition or "remanufacturing" of wheels. Wheel reconditioning generally involves "sandblasting" used truck wheels and repainting them to make them look new. The reconditioning of wheels is typically being done by tire dealers and tire retreaders who do little to control paint thickness. There are four primary causes of hub failures. They are lack of lubrication, overloading the vehicle, installing the axle nut too tight, or installing the axle nut too loose. Usually, hub failures are progressive and will produce some evidence of the impending failure. Evidence of a failing hub can include leaking hub seals, tire tread wear anomalies, sounds, smells, smoke, and steering wheel feedback. The bearing preload is adjusted by tightening the axle nut down against two cone-shaped bearings. As the nut is tightened, the hub assembly becomes tight and the play is removed from the system. Once the bearing preload is adjusted, a lock is installed to prevent the axle nut from moving. Although, there are many types of locks for axle nuts, some common ones are a cotter pin placed through a castled hex nut or a keyed washer placed over a flat hex nut followed by a second nut to hold the washer in place. Torque the adjusting nut to 200 lb-ft to seat the bearing components. Always rotate or oscillate the wheel while torquing the adjusting nut to ensure that the rollers are fully seated against the cone large rib. Back off the adjusting nut one full turn or until it's loose. This is where you actually establish end play. Torque the adjusting nut to 50 lb-ft while rotating the wheel hub assembly. Back off the inner (adjusting) nut the appropriate amount as indicated by the chart at right; e.g., 1/6 of a turn for a 12-threads-per-inch front steer axle. See chart at right for the exact back-off amount. On a single-nut system, install a cotter pin. On a double-nut system install a jam nut and torque it to the proper specification, which varies depending on the size of the nut. Once these steps are preformed, also recommended is that the hub's end-play be measured with a dial indicator to verify proper preload. A hub that is adjusted too loose will allow the hub and wheel assembly to oscillate laterally. This will cause bearing wear and will cause a further increase in hub looseness. The loose hub allows excessive movement of the bearing rollers resulting in roller cage wear and uneven race wear or "scalloping". If not repaired, the bearing play will increase progressively to the point where the hub fails. A hub that is adjusted too tight will not have a lubricant barrier between the bearing rollers and bearing races. Without a lubricant barrier, the bearing will overheat and fatigue. This condition will lead to full bearing lock up and hub separation if not corrected. This condition will be evidenced by heat discoloration and fatigue spalling on the bearings. Overloading a hub creates similar conditions as over-tightening the hub. The excessive weight forces the lubricant from between the bearing rollers and bearing races on the loaded side of the bearing causing localized heat and fatigue. Lack of lubrication also causes metal to metal contact between the bearings and races. This results in excessive heat, bearing and race scoring, and microspalling fatigue. This condition, if not corrected, will lead to bearing lock up and hub separation. The mechanism of failed hub separation can vary by the design of the hub. Some hubs have a small outer bearing and axle nut. 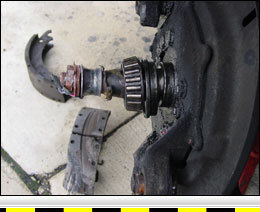 When the outer bearing fails, the hub can just slip past the axle nut and remaining parts of the outer bearing. In hubs with large outer bearings, separation of the hub occurs when the oscillating hub causes the axle nut to be pulled off the axle like a bottle cap. In other cases, the axle nut is pulled off the axle, ripping the threads out of the axle nut and leaving the threads on the hardened axle relatively undamaged.